Eman Ibrahim started volunteering in Iraq’s first cancer support center in the northern Iraqi city of Erbil when she was 18, providing psychological support and reading to patients. It was satisfying work for the energetic young woman, if heart-wrenching at times. 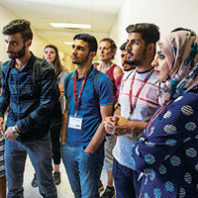 Yet, when the 21-year-old Kurdish medical student from Hawler Medical University became head of the Erbil Hub center last year, she wanted to do even more to help—and that meant learning new ideas. Last July, she got her opportunity with the Iraqi Young Leaders Exchange Program. On February 2, 1991, during the first Iraq war, Capt. R. Dale Storr (’83 Mech. Engr.) was captured by Iraqi soldiers after his A-10 Thunderbolt was shot down near Kuwait. The 29-year-old Air Force pilot from Spokane was a prisoner of war for 33 days, spending a portion of that time in Baghdad’s Abu Ghraib prison, while his friends and family believed he had died in the plane crash. He was regularly beaten and interrogated by the secret police, but used techniques taught to him at the survival school at Fairchild Air Force Base to get through it. In late January students, friends, and faculty gathered on the Pullman campus for a memorial service and candlelight vigil for First Lieutenant Jaime (Krausse) Campbell, who died when the BlackHawk helicopter she was flying went down in northern Iraq January 7. The 25-year-old graduated from WSU in 2002 with a degree in apparel, merchandising, and textiles.